Staples is offering 20% off when you buy $50 in select gift cards. The ad shows Toys R Us, Xbox and Petco GCs. More GCs might be eligible (need to check when deal goes live). 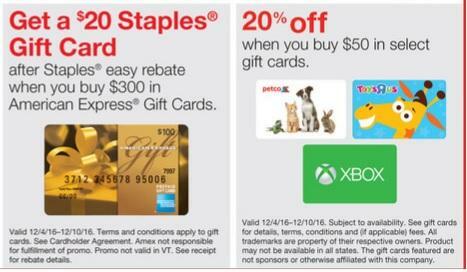 after Staples® easy rebate' when you buy $300 in American Express® Gift Cards. Adding this in case it is possible to double dip on the discounts.